Do you have children’s table to set up? What a great idea this is – just get some colouring placemats. 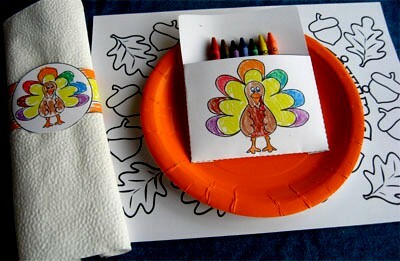 decorate a napkin paper ring and a crayon pouch with Thanksgiving theme pictures (you can use stickers you buy at your local discount store) and you will have something that will keep the kids occupied! I love the simplicity of this setting and the use of colour. Adding a little pumpkin adds just the right accent and the moss green colour is very effective in contrast. 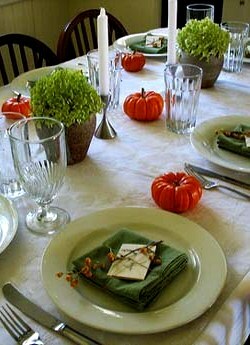 matching the potted, simple centerpieces. How adorable is this centerpiece? 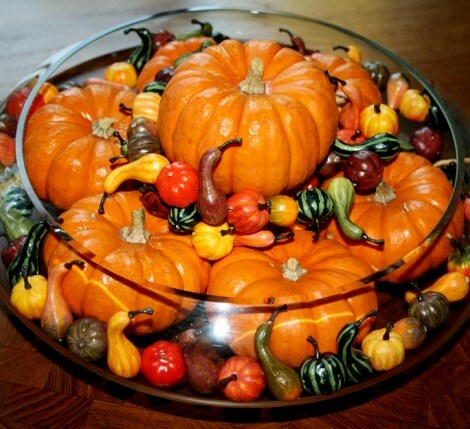 And all it will take is a pumpkin – fresh or a plastic one can be used here. Collecting some branches outside and adding colourful leaves, little birds and a cute little bird house can be very easy and very inexpensive. i have seen all these items in our local dollar store – and this is the centerpiece I am definitely going to make! 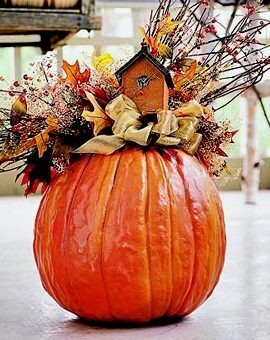 I would recommend placing a florist foam into the pumpkin first and securing all decoration in that way. Again – simplicity is what makes this decoration effective. Most items used can be gathered outside – why not take your kids out for a nature walk and make several of these beautiful decorations together? 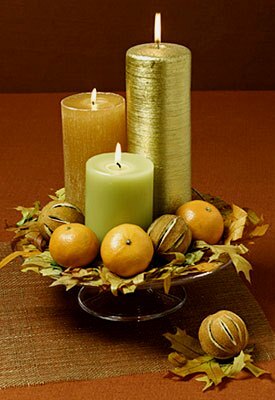 One of my favourites – using different heights and colours of pillar style candles – especially adding a metallic one, nestled on a bed of fall leaves, along with a few colourful gourds will make a centerpiece all your guests will admire! 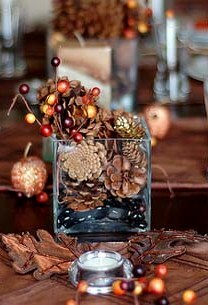 And think about using this concept for your Christmas table – it would be very easy to replace the leaves with pine branches, add some pine cones and colourful Christmas balls or bells…. are you thinking? Warm and very friendly – that is what I would call this design. Love the round wicker placemat under the plate – think about how well this would work if you are using disposable plates! The leaves could also be replaced with ones you could gather outside, or you could purchase silk leave garlands or arrangements at your local craft store and remove individual leaves. 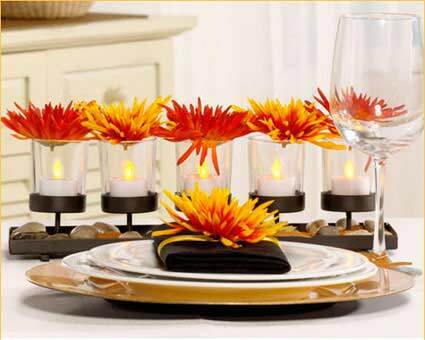 The candle holders are great – and definitely easy and inexpensive! Hope you have enjoyed this information – please send me your comments. 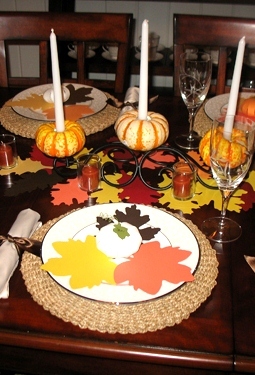 suggestions and experiences – and pictures of your holiday table settings! Your input is always very welcomed and much appreciated!